Stretching north of the airport on the western facing side of South Bali's long peninsula is a seemingly unending stretch of hotels, bars, restaurants and tourist shops. Tuban, just north of the airport, is the most recently developed of the areas, with some shopping centers and upmarket hotels. The lines between the various beaches are somewhat blurry and depend, as much as anything, on who you're asking. The stretch of beach along Pantai Kuta road is labeled 'Legian' on many many maps and signs, but I tend to think of it as Kuta, while Legian 'proper' starts at the Legian hotel and runs north. 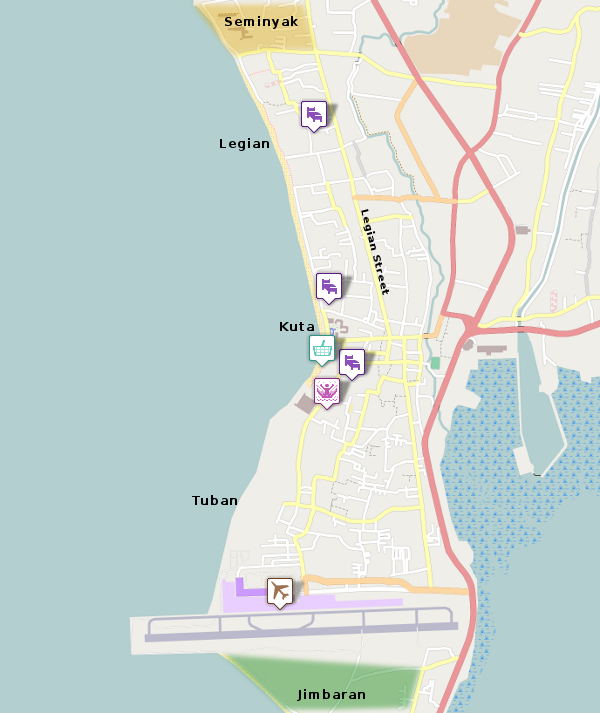 Kuta is the oldest district of the area and where you will find the highest concentration of hotels for all price ranges, as well as everything else. It's also the most congested. Next is the slightly quieter Legian area. The Kuta-Legian beaches are some of the most popular with surfers, and the best places to find lessons for beginners. Further to the north, Seminyak is the place to stay if you want to be well away from the crowds, but within a short taxi ride of shopping and nightlife. It's not nearly as developed. You'll even see a rice field here and there if you explore the district. There aren't really and attractions in the area to speak of, aside from the beach. Across the street from the Discovery Shopping plaza around the middle of Kuta is the Waterbom water park. It's a good place for families that enjoy the water but are a little tired of the beach. Further up the street from this is the Kuta Art Market, a small collection of stalls selling local handicrafts. It's not as good as some of the larger markets at Sukawati or Ubud, but it's worth a browse.